On March 27, just a few weeks before Marc Golczynski was to return home from his second tour in Iraq — one he volunteered for — he was shot on patrol and killed by enemy fire in al-Aanbar province. 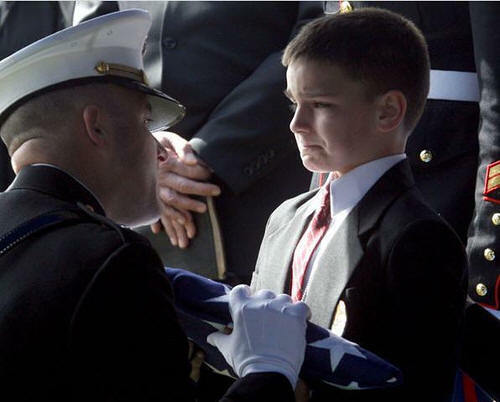 During a moment at the burial, Christian stepped forward to receive the flag for his father. The expression of grief on his young face was captured in a photo and became a powerful symbol for soldiers, their families and anyone who sees it. Fewer people would die on the road. Demand for high-mileage cars could grow. Shorter security lines [at airports]. High prices lead to lower prices. Some of those are really a stretch. Not only is MSN looking for ways to put lipstick on this pig, but they’re even straining credulity in some of the reasons they offer. “End of wars,” for instance. The logic is that the massive costs of fuel for the military – up to $400 a gallon, apparently – would simply make military efforts in Iraq, Afghanistan, and Libya too expensive to continue. So Americans should be happy that the financial burdens on the military are so great than they can’t complete their missions? That’s a pretty contestable assertion. The “local businesses could profit” claim is also premised on some specious logic. “If you can’t afford to drive out to Wal-Mart or Home Depot, you may be buying instead at the local supermarket or neighborhood hardware store,” claims MSN. Of course virtually all goods-selling businesses are burdened with higher costs by rising fuel prices. The inevitable rise in the cost of the goods themselves leads to fewer purchases. A small business is less able to withstand such shocks than a big box store, and will therefore be disproportionately hurt by them. California Teacher Tells Kindergarteners There Are \’More Than Two Genders\’.